Bartercard’s large referral network allows members to increase their customer base and expand their geographic reach. 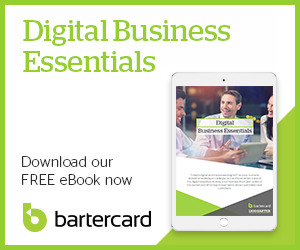 The new customers generated by Bartercard are on top of existing cash business, and therefore don’t interfere with existing business. One of the keys to sales success is referrals and word-of- mouth marketing. Bartercard members are more likely to spend with other members, providing an increased advantage over competitors. If you perform a good job for a client paying with Bartercard, they will undoubtedly refer their cash-paying friends, clients, family and associates to you. In the case of traditional cash-paying exchanges, there’s no guarantee the transaction will be anything more than one-off. However, with Bartercard transactions, each time a member spends, it will come back to them in the form of new business from another Bartercard member business. The world is forever changing and attracting new customers in a market that's louder, faster, and where consumers are more discerning, can be harder than ever. This is where we can help. We've created this free resource to help you re-think your approach to attracting new customers and growing your market share. Do discount models attract the right sort of customer? This blog features three of the eight techniques to implement to help you re-think your approach to attracting new customers, while evolving your skills as a business leader. One of the key factors of being successful in business has always come down to networking with the right people. We've got some quick tips for successful networking to ensure you maximise all of your opportunities. Finding partners that have brand synergy and share similar markets can leverage your business and expand your customer base. But did you know at least 50% of partnerships fail in the first 2-3 years? This statistic alone may scare you into staying solo, but we have the insight to keep your partnership rock solid.